Yesterday afternoon was beautiful and sunny so we decided to work in the yard. 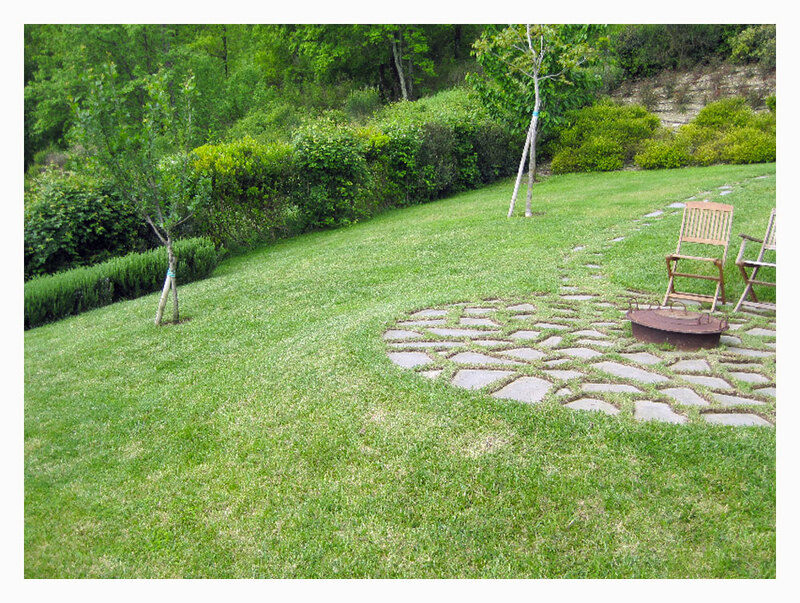 The stone area around the fire pit was almost totally covered over by grass, so we began the difficult process of prying the overgrown grass up so we could see where the edges of the stone were, and then using pruning clippers to cut it back to the original shape. That sounds easy enough, but it depends on how many stones there are to trim. The answer to that one is: waaay too many. But we stayed with it until late afternoon when we were both sore and exhausted. At one point I fell over in the grass moaning about how tired I was and wanted to stretch my back from what seemed to be a permanent curve. Suddenly I started rolling down the sloping yard and before I knew it, I was going full speed toward the young plum tree which couldn’t withstand the impact, so Cheryl called for me to stop! With head spinning, I got my bearings and managed to get a grip on the grass just before hitting the tree. Laughing and dizzy, I then called to Cheryl, who was still diligently working, taunting her, “When was the last time you rolled down a hill?” She couldn’t remember, and with just a little coaxing, she decided to give it a try. With a serious grass trimming-work must be done expression of on her face she fell back onto the grass and she started to roll. With hands over her head holding onto her hat (why she didn’t take it off we don’t know) she started picking up speed. Soon she was clearly out of control, turning faster and faster in the newly mowed grass. “Em, where are you?” she called as she zoomed faster and faster down the hill. In my lingering dizziness, I looked up to see her rolling past me at break-neck speed—laughing like a kid on a merry-go-round for the first time. She clearly had no idea where she was, but she was having the best time ever. Before either of us knew what was happening, she had crashed into the rosemary bushes just before the yard drops into a semi-cliff. I crawled over to where she was jammed into the bushes, and saw that she looked a bit disoriented and slightly crazed. With one leg thrown over the top of the bushes and an arm extended, she grabbed onto me to keep from falling further. But rather than checking for injuries, to our surprise, we laid there in a heap together uncontrollably laughing like we were kids again. 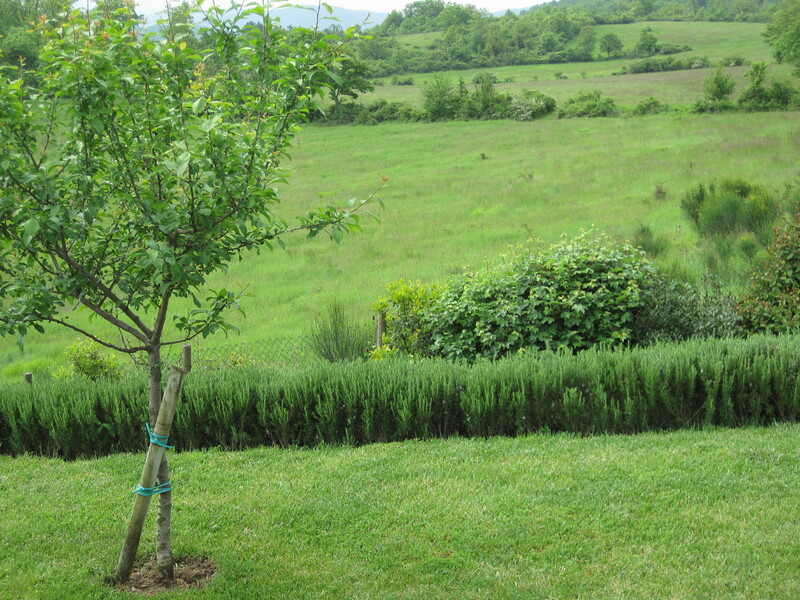 The photos show the results of our day of labor and the location of our impromptu tumble— the freshly groomed stones (which we thought looked great), the initial slope that got us started, the plum tree, and the rosemary bushes where the fits of laughter took place. It was an afternoon to remember. Great story. We were laughing so hard we rolled out of bed into a rosemary bush.